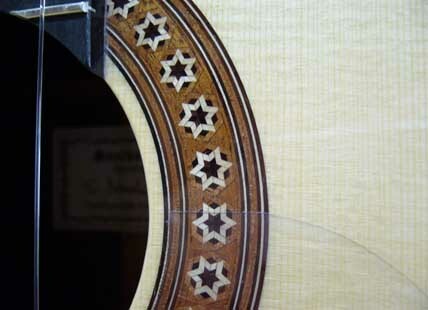 Different types of wood are worked up in traditional guitar construction, diverse Spruce and Cedar species for the top, and varied Rosewood, Maple and Cypress species for back and sides. 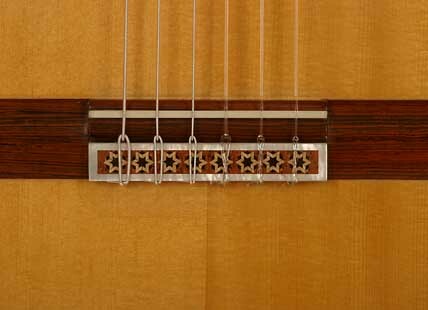 Fingerboards are made of Ebony, and Mahogany related woods are used for the neck, i.e. Cedrela (Cedro), Sippo or Khaya. 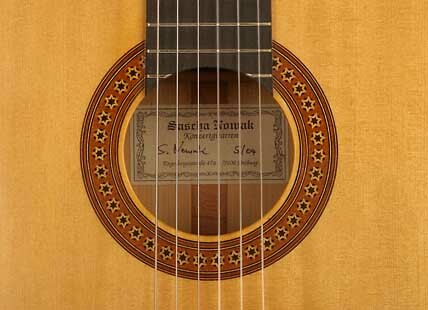 Due to the favoured result (concerning colour spectrum, function and aesthetics) they may be variably combined (a well known example is the combination of Spruce and Cypress for a certain kind of flamenco guitar). tuning machines, rosette motives, neck profile and dimensions, string spacing, etc. according to individual preferences and on request. In principle every scale length is available, common is a length between 63 and 66 cm. Acoustically treated the guitar forms a coupled oscillation system (look also at the „workshop“-site). Starting from scale length further components like body dimensions, bridgeposition, depths of sides, sound hole diameter and position, etc. must fit together. Aside from acoustic there exist also aesthetic reasons to correlate the body dimensions. It is no coincidence if a design appears elegant or plump. Plenty of geometric basic shapes, symmetry axis, and correlations of proportion can be found. Certain principles recur and can be transferred to modern guitars. At the moment I use 5 different body shapes.